How I’m learning to love to fly. Yep, that’s me. 1974. 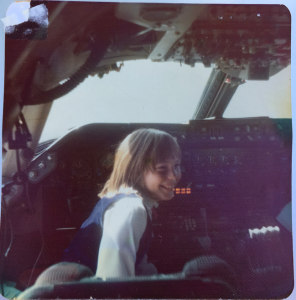 Sittin’ in the cockpit of a Pan American Airways 747, on my way to Bermuda with my Mom. Lucky me. At this point in my life I loved to fly. I was talking with one of my favorite people recently, telling her about my upcoming vacation and my uncomfortable fear of flying. “Oh I love to fly”, she said. “I love that feeling when you’re taking off…” I stopped hearing her at this point – focusing instead on the ridiculousness that my heart rate had jumped, my palms were sweating and the hair was up on the back of my neck just listening to her talk about it. “How did you learn to love to fly?” I asked, earnestly. I really needed to know. I admire this woman. I trust her. “You should write a blog post about that”, I suggested to her. Well, she hasn’t had the time or the inclination (yet). But like I said – I need to know. My vacation is coming up and I have to fly across the ocean. I really want to love every minute of this trip. How can I learn to love to fly, again? I realized my answer lay in how I unlearned. I travelled a fair amount in my previous career. I had a few experiences that kinda scared the hell out of me, like a crazy rapid decent out of overcrowded airspace in Atlanta, a white-out blizzard landing in Salt Lake City, and a stomach-twisting flight across Washington State in a terrible storm on some old plane with propellers. (NEVER again.) That definitely started the flip in my perspective. Since then I’ve taken my share of flights and most have been uneventful. And while I’ve been very nervous on some, I’ve made it through others with less suffering. This is good to remember now. A pro at this stuff suggested I focus on the “reasonableness of my safety” while flying and my “desire to take the trip”. Logic and love. Nice combo. So; I’m safer flying than I am driving home (one glance at Ritchie Highway and I think I can believe him). And this is the first trip for my husband and I in many years – no kids. A location that’s been on our wish list for a long time. Easy to love. And then this: I noticed last week during a workout that I was really uncomfortable in my skin. I was focused and pushing myself a bit more than I have recently. My heart was beating hard, my skin was flush, I was vibrating. And I could feel myself trying to get away from the feeling. Huh? I used to love this feeling – alive, powerful, confident, happy. This was medicine for me for a long time. Until this feeling became associated with something else. Rapid heart rate, flush skin, inner vibration became a chronic physical state for me after my son went through a life-threatening illness. For months I startled at everything, didn’t sleep soundly, avoided any form of sensory overload. I was in a constant state of fight/flight. I struggled to turn it off. It wore me down and ran my life like I’ve never experienced. Simplified somewhat, it comes down to adrenaline and cortisol. The hormones that produce an excited high also flood the system during anxious moments. Same hormones: different circumstances. I’ve got to flip my perspective. I understand now what behaviorists mean when they say it takes 10 positive experiences to override a single negative. (For me I’ll say at least a hundred- my stomach still jumps a bit when my son calls me.) Between now and departure day I’m coming at my workouts hard. Getting comfortable with being uncomfortable. Focused on logic and desire. Learning to love to fly, again.